Summer is coming to an end, which means that prices on berries are still within a reasonable range. I love this time of year because my favorite fruits are still affordable. I mean, seriously, who can consistently pay over $4.00 for a single serving of raspberries? And forget baking with them because suddenly you have $20 worth of fruit mixed into one recipe! Crazy, right? There’s just something about berries that make this simple fruit irresistible. 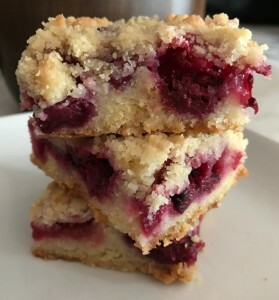 So when I had to make a dessert for a co-worker’s going away party this week, I knew exactly what I wanted to make while I still had the chance; Mixed Berry Crumble Bars. These sweet, fruity bars really do give you that last taste of summertime. They are light and refreshing with buttery crumble topping. Not to mention, they are super easy to make. Even my husband, who dislikes the seeds in berries, enjoyed a few of these bars. 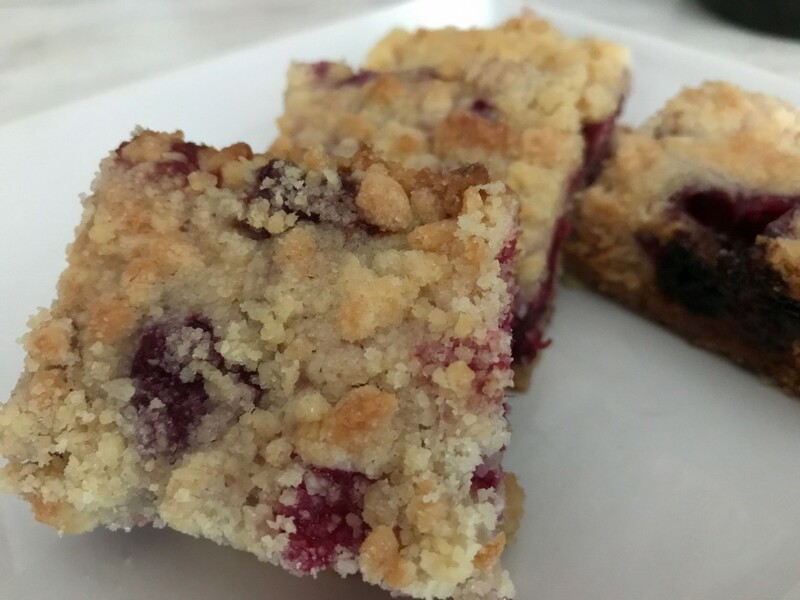 Mixed Berry Crumble Bars can be served many ways. Trust me, I tried several of them! They can be enjoyed warm out of the oven or at room temperature. If you really want to live on the wild side, crumble a bar up over top of cookies and cream ice cream. Can you say A-MA-ZING?!?! Oh, and what actually made it to the work party went over pretty well! I think it’s safe to say that I will be making them again, as long as the prices of berries allow it. If you like this recipe, check out my post on Fruited Danishes. Preheat oven to 375° F. Grease a 9×13 pan baking pan. In a medium-sized bowl, stir together flour, 1 cup sugar, baking powder, and salt. Mix in butter with hands until butter is well incorporated and in small pieces. The butter pieces should be about the size of peas. Stir in egg. Press half of the dough in the bottom of the baking pan, spreading out evenly. Cut the blackberries in half and the strawberries into quarters. Mix together with cornstarch and sugar in a medium-sized bowl. Sprinkle evenly over the crust in the pan. Sprinkle remaining dough from bowl over berries. Bake at 375°F for 30-35 minutes or until lightly browned. Remove from oven and let bars cool completely. These crumble bars look so tasty and perfect for breakfast! Thanks for sharing. Can’t wait to try them. I love raspberries so I definitely need to try these out as they look absolutely delicious. I really try out this recipe. This fruity bars will really make a delicious chop. oooh… I have never considered crumbling bars over top of ice cream. This is a must try! These. Look. So. Good! I’m gonna need to try them this weekend – thank you for sharing! I just made a crumble the other night with blueberries. The berries were on sale. I am going to go back and see if they have anymore. These look so good. Saving the recipe for thanksgiving. I love these! They look delicious and great for an energizing snack. I would take these with me to a workout. These look soooo good! We have wild blackberries everywhere in Seattle- like they’ll take over everything without much effort. The ones on the walking trail by my house are just finishing up for the season right now. These are great for tea time, they look delicious. These crumble bars looks so tasty, thanks for sharing the recipe. These look and sound amazing. I definitely get you about the prices of berries! They can get pretty pricey when you need a whole bunch of them for a recipe during the off season! I know we definitely splurge on them when they are in season! looks yummy. any substitutes for corn starch and sugar? These look so pretty and delicious. My stomach is now growling – better get baking! Thanks for sharing this post. This looks so good, perfect for breakfast. Thanks for sharing this, can’t wait to try this. This looks so good, perfect for breakfast time. Thanks for sharing this recipe, can’t wait to try it. I love blackberries and strawberries. I’m sure they would be a delicious combination in these bars. I always thought that berry crumble bars were difficult to make but this looks so easy and delicious! I’ll have to try! I do think there are some difficult recipes out there, but this one was very easy! If you try it, let me know your thoughts! Thanks for visiting! I love a good crumble, especially when it’s just been taken out of the oven and it is still hot. I like adding a scoop of ice cream on top. This is a perfect recipe for autumn, to make with the mixed berries in your garden. If you have your own garden with berries, I am officially jealous! haha. As with most baked things, they are best warm from the oven, don’t you think? Thanks for reading! This crumble bars looks so easy and Yum! Way cheaper than store bought bars, and I am pretty sure it’s way less sugar. Love! It’s definitely a lot cheaper to make them, plus knowing exactly what is in anything homemade is a bonus! Thanks for reading! These bars look so yummy, I bet they would be amazing over ice cream! I’m going to have to try these soon. With fall right around the corner, I think reasonable berry prices may be a thing of the past soon. It’s a shame that berries can’t stay cheaper year round, huh? Thanks for stopping by! These looks very yummy and delicious. Kids will definitely fell in love with these in an instant. You’ll have stop back and let me know how they liked them! Thanks for visiting! I will definitely going to be trying this recipe. I am just getting into cooking. This one will be fun to try! It’s a great recipe to try if you’re just starting out! Thanks for reading! These would go perfectly with my morning turmeric latte! I never thought about having it with a latte. Such a good idea! Thanks for reading!